Working on Same Painting: Sorry I'm late. Having a Breakthrough Day: That's ok, time doesn't exist. Stars: "A Whole Lot of People"
The common definition of a slacker is someone who has no ambitions in life, content to just subsist on the bare minimum as long as it means avoiding making a choice or exerting effort. To Richard Linklater, if Slacker is to provide any insight, the term refers to a person who is open to all of life's possibilities, someone who looks at the world around him and bothers not just to ask why, but to seek an answer. Sure, it just so happens that a fulltime examination of self and an investigation into the mysteries of the universe may leave little time for a job at Starbucks. So what? The film starts with a man on a train. He gets out, grabs a cab, and starts talking to the silent cabbie, explaining his theory on parallel universes. He reaches his destination and gets out of the car, on a street when a woman has just been killed by a hit and run driver. We leave the first man, and drift to a car pulling by on the street. The driver gets out and goes into a house, where he lights candles and burns old photographs. It turns out he's the son of the dead woman, and he just ran her down, but those details are incidental, and by the time the police have shown up to arrest him, we've moved on again. The only driving force in Slacker is the constantly moving camera, which stays with one character or conversation until something catches its interest and it peels off and follows someone else. It lingers in a home where none of the roommates really know each other, eavesdrops as they try to remember details of a departed boarder and come up short. It runs into a conspiracy theorist that believes the moon landings were a hoax and the government colonized Mars in the 1960s. It observes a man who believes the only way to truly experience a moment in life is to record it and dissect it later (he walks around with a TV strapped to his back). Famously, it also, by chance, encounters a lady with a unique piece of pop music memorabilia to sell. Overall, Slacker captures a moment in the lives of more than 100 assorted eccentrics, every one of them with a theory to espouse or a rant ready to go. Fans of Linklater's later work who somehow never got around to seeing Slacker will be comfortable with his nascent style and talents�this is the first in a long line of loosely structured, talky think pieces from the director, an obvious precursor to Waking Life, which is basically Slacker on acid, and Before Sunrise, an example of what would happen if the cameras in this film remained with the same two people for an entire evening. I realize the concept of a film made up of randomly linked conversations sounds boring, and to an extent, that's true, but in capturing so many different wacko personalities, so many different aspects of people who feel like real-life characters, Slacker can't help but be boring, at some point, to every viewer. What's remarkable is the way you can sample segments of the film and see if they spark your interest. Maybe you'll be hanging on every word, hoping the camera won't peel away, or maybe you'll lose interest until something new diverts your attention. It's not for the viewer with the short attention span, mind you�it's still a film with no discernable action or plot�but creates an idealized image of the vibrancy of life going on all around you, so many different people with different theories on life and different ways of looking at the world, colliding onscreen for 100 minutes... It forced me to realize how mundane so much of life is, how rarely, in the course of a day, we consider the larger questions. In Slacker, most everyone is questioning, and their enthusiasm, their ability to seize on something they're passionate and expound upon it in great detail, is fascinating, even when what they talk about might seem absurd or ridiculous. Slacker is a remarkable construct, a much more ambitious piece that it initially seems. It's easy to imagine a large segment of the movie-going population dismiss it out of hand as pretentious drivel, empty philosophy in search of a story. But Linklater, working with a tiny $28,000 budget, has done much more. He has carefully edited his material, carefully arranged the stories of his crazy cast, to create a constantly moving, challenging film that demands your attention and requires you to engage in what is being said, though you know nothing of its context or the characters it so concerns. The characters in most films do nothing but move the story along with exposition and a string of clich�s, those in Slacker exist only to be unique and original. Image Transfer Review: Slacker is presented in its original 1.33:1 aspect ratio, and it looks better here than I've ever seen it look before (both on film and on VHS). It still has a grainy, 16 mm look to it, but the image looks clearer and shows off background detail like never before. Black level is only fair, but colors look very warm and natural. I noticed no digital anomalies like artifacting or aliasing. Slacker fans will be very happy with this transfer, created by Criterion with the help of Linklater and director of photography Lee Daniel. Audio Transfer Review: Audio is presented in a perfectly suitable 2.0 stereo track that preserves the v�rit� feel of the speech and sound effects. Dialogue is always understandable, which is good, as it's 80% of the mix, and ambient noise and sound effects fill out the front soundstage. Short of a needless 5.1 remix, this is the best I can imagine Slacker sounding, given the limits of the source material. Extras Review: Criterion has included three commentary tracks for Slacker. The first features director Richard Linklater flying solo, and he shares his personal history with the picture and explains what he wanted to do with it. The crew commentary features Linklater, director of photography Lee Daniel, and co-producer Clark Walker. This track is very focused on the making of the film, and all three seem to have very specific memories about shooting each particular scene. The cast commentary features 12 members of the cast, each of whom was recorded separately and comments over his or her scene only. They share memories of the shoot, but nothing riveting, and there is a lot of downtime between their musings. Slacker's original title was "No Longer/Not Yet," and a few pages from that script are included. Showing Life is a 14-minute gallery of interviews with the cast conducted to make sure potential actors had the personality and charisma to play slackers on film. The section includes an introduction from casting director Anne Walker-McBay. Taco-and-a-half After 10 collects 12 minutes of "home movies" shot on-set during the production of Slacker. It all looks pretty rough, and not a lot seems to be going on in most of it, but it's an interesting look at the work that goes into making a no-budget movie. Les Amis is a 10-minute clip from a documentary on the Les Amis restaurant in Austin, where several scenes in Slacker were filmed. Director Nancy Higgins charts the history of the place, a hangout for artists, free thinkers, and other slackers, lamenting the fact that it closed in the mid-1990s and has now been turned into a Starbucks. Closing out Disc 1 is Shooting from the Hip, a gallery of still from the production. Disc 2 includes the bulk of the extras, including the real prize�Linklater's first full-length feature, never before available on home video. The 85-minute experimental picture follows a man around as he goes about his daily life and then travels the rails to visit friends and family. There is very little dialogue and not much in the way of story, but you can see in it the germ of Slacker, as well as Before Sunset and Waking Life. Linklater provides a commentary track, and if you only watch the film once, do it with the commentary on�hearing Linklater discuss his lifelong love of cinema and his experiences making an entire movie by himself for $3,000 is more interesting than the rather abstract feature. Woodshock is a Linklater short film, a seven-minute visit to an Austin music festival in the spirit of psychedelic films of the 1960s (or so the liner notes would have you believe). The Austin Film Society includes a bit of background of the film group Linklater helped found in Austin in 1985; the group now gives grants to aspiring filmmakers. Included are two essays from society members and a gallery of flyers advertising the group's weekly screenings (look carefully and you'll spot many titles that eventually wound up being released on DVD by Criterion). Ain't No Film in that S*** provides a combination of the film's original shooting script (dubbed "the roadmap," it outlined every scene in summary) and a deleted scenes gallery. The screenplay is basically more of an outline, and as you click through it, you'll access deleted or alternate scenes in their appropriate places. You can also access the deleted scenes separately; there are 14 cut scenes totaling about 28 minutes of rough footage. End of Interview! is a 20-minute reel of interviews with the cast and crew of Slacker conducted during a celebration for the film's 10th anniversary in 2001. It's funny to see how much or how little some of the people have changed�the guy who played "Been on the Moon Since 1950" is still as chatty as ever, that's for sure. Finally, closing out the second disc is a lengthy essay by Linklater on the definition of a slacker and the slacker generation, and the original theatrical trailer. Criterion's design work is stellar as usual. 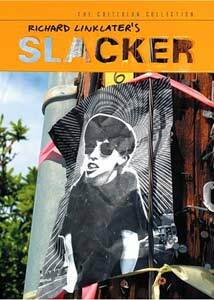 Slacker comes packaged in a two-disc cardboard slipcase with all new artwork and includes a 64-page booklet of essay on and inspired by the film, recollections from the cast and crew, and tidbits from the production like the letter Linklater wrote seeking a grant to fund the film. Richard Linklater's heady, meandering experiment in slice-of-life filmmaking is assured, original, and not for all tastes. Roger Ebert gave the film a rave review, but admitted he might have dozed off here and there�I don't know if that's such a bad thing. It's interesting to see a picture that's intentionally both so engaging and, at times, so off-putting or even boring. All you have to do if you feel your interest wandering is to wait for the camera to peel off and follow someone else's story. Rich, vibrant, and full of life, Slacker is a landmark independent film and Criterion's wonderful two-disc DVD release gives it its due with an eye-opening transfer and comprehensive extras.